Personal: Mike lives in Greenwood, Indiana with his wife, Rebecca, and their two dogs. Hobbies: Running, coaching, golfing, visiting wineries, and enjoying the beach. • Learn and improve my understanding of the janitorial industry and our competitors in my region. • Be a coach and mentor to team members by working with them in their personal development and goals. • Be an encouraging leader and manager through leading by example and sharing my experience in service and operations. • Enhance and develop communication and rapport with customers to further develop relationships within our business. Mike graduated from Indiana University with a Bachelor’s degree in Education and a minor in Physical Education and Health. He also has a coaching certificate and has coached at all levels of basketball including middle school, high school, and AAU. 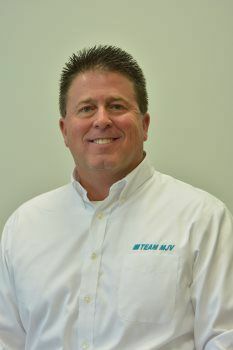 Prior to joining the MJV team, he spent 20 years in the industrial laundry business working with rental and direct sale customers. He has worked as a District Manager, Area Service Manager, and an Area Vice President. Mike’s 20 years were spent in a management capacity with responsibilities in sales, operations, and service. During his tenure in the industrial laundry business, Mike has managed multiple states and over 80 employees in the Midwest area. His experience in service and operations will be very helpful as he takes on the role of Regional Coordinator for the Southern Region. He is excited to be at Team MJV allowing him to grow, learn, and develop in his new career.